Is this the week that we've all been waiting for?! A week that actually FEELS like Spring!! It's in the 50's, 60's, and 70's (PTL!!) this week, and I am so, so happy that it's bright and sunny out. It's been a long, dreary winter, so this sunny weather is doing my soul some good. With this nice weather, I've also been wearing some of my favorite spring outfits (like the one in today's post! ), and I've started wearing my fav open-toed shoes again! I wanted to do today's post a little different--so I'm trying something new! I styled my white button-down TWO ways so that you can see the versatility of the top, and maybe it just might spark an idea for one of your spring outfits. The first way I styled it was just a classic French tuck. I'm obsessed with the French tuck, and it's totally how LOFT would want me to tuck this top. You can also totally wear this top completely out--it's a longer tunic style, so it would look cute with leggings for a more casual look. The next way I styled it was with a little tie! Since the top is a tunic style, it can be worn tied as well and still be long enough. I just unbuttoned the bottom button, did a little bow, and I just love the way it looks. I can't wait to wear it like this with shorts in the summertime. A few weeks ago, I also wore this button-down completely tucked into palazzo pants AND paper bag pants, and I love, loved the way it looked! This top is going to be a major staple this season, and this definitely won't be the only time it appears on the blog this spring. Now, we just have to take a moment and obsess over these shoes together. 😍 As soon as I saw them, I knew I had to have them. They're a total Valentino dupe, and they are super comfortable! I'm on my feet all day at work, and I wore them with no problem the whole day. They were perfect for a casual look like this one, but they will also look darling with my new romper (I can't wait to show you!! ), and so many other outfits--from denim to dresses, they will pretty much always go! Okay friends, that's all for this post. I have been so sleepy this week, and I'm in need of a little self-care night, so I'm going to do just that! I hope you're having an amazing week. 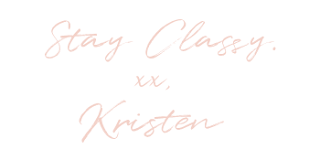 What do you think of the styled two ways post?! Do you think I should keep doing them?